For the salmon en croute, preheat a large baking tray in the oven. Unroll one pack of pastry and roll a little longer until it is about 2cm/¾in larger all around than the piece of fish (check that it will fit on the baking tray, you may have to place it diagonally.) Place the pastry on top of a sheet of baking parchment so that you can easily slide the pie onto the hot baking tray. 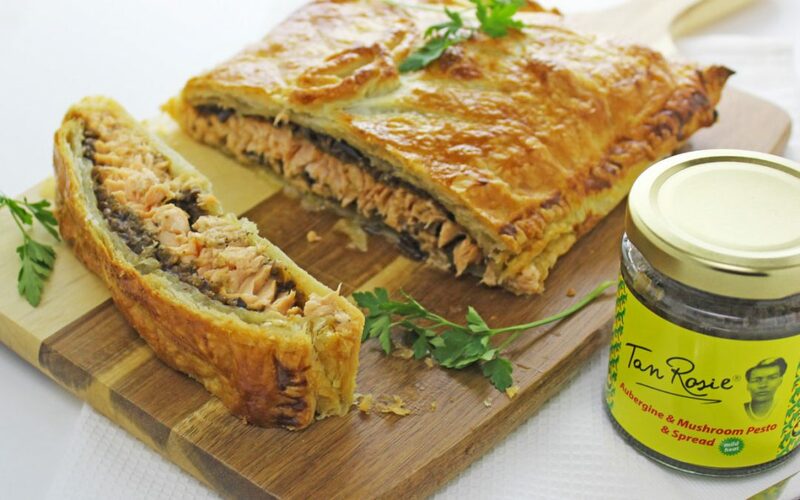 Place the salmon on the centre of the pastry and spread with the pesto. Brush the edge of the pastry with beaten egg. Roll out the second pack of the pastry to a rectangle slightly larger than the first one so that it drapes over the fish and filling. Carefully lift it over the salmon, trim off any excess and press the edges well to seal. Re-roll the pastry trimmings thinly and cut out pastry decorations if liked – such as little fishes. Brush the pastry with beaten egg. Carefully slide the pie onto the preheated baking tray on the non-stick baking paper, and bake for 35-40 minutes, or until golden-brown both on top and underneath. Allow to rest for 10 minutes before serving.